The first award-winning season of The Classic Tales Podcast, topping the iTunes charts as the #3 overall podcast. Here B.J. Harrison reintroduces the world to the greatest short fiction ever written, from Poe, Dickens, Hardy, Stevenson, Fitzgerald and many, many others. Titles include: "The Cask of Amontillado", by Edgar Allan Poe; "The Speckled Band", by Sir Arthur Conan Doyle; "Barbara of the House of Grebe", by Thomas Hardy; "Rappaccini's Daughter", by Nathaniel Hawthorne; "The Monkey's Paw", by W.W. Jacobs; "The Lost Phoebe", by Theodore Dreiser; "The Pit and the Pendulum", by Edgar Allan Poe; "The Magic Shop", by H.G. Wells; "The Red Headed League", by Sir Arthur Conan Doyle; "The Baron of Grogswig", by Charles Dickens; "The Ambitious Guest", by Nathaniel Hawthorne; "The Tell-Tale Heart", by Edgar Allan Poe; "The Mortal Immortal", by Mary Shelley; "Tobin's Palm and The Ransom of Red Chief", by O. Henry; "The Eyes", by Edith Wharton; "The Happy Prince and Other Tales", by Oscar Wilde; "The Devil and Tom Walker", by Washington Irving; "Hurst of Hurstcote", by E. Nesbit; "Selections from Hamlet", by William Shakespeare; "The Captain of the Pole Star", by Sir Arthur Conan Doyle; "The Vampyre", by John Polidori; "The Mark of the Beast", by Rudyard Kipling; "The Hand", by Guy de Maupassant; "The Legend of Sleepy Hollow", by Washington Irving; "Young Goodman Brown", by Nathaniel Hawthorne; "The Celebrated Jumping Frog of Caleveras County", by Mark Twain; "The Cortship of Miles Standish", by Henry W. Longfellow; "The Curious Case of Benjamin Button", by F. Scott Fitzgerald; "The Gift of the Magi", and "The Last Leaf" by O. Henry; "A Christmas Carol", by Charles Dickens. 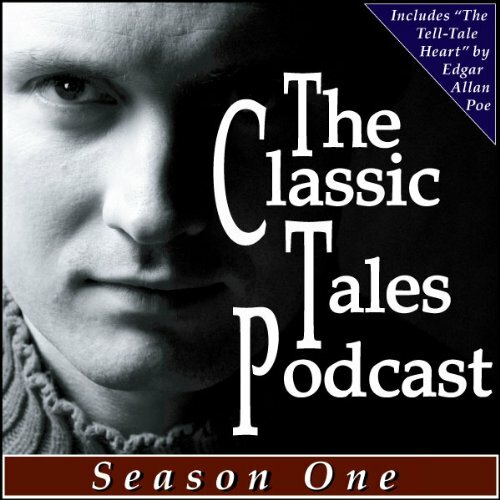 What made the experience of listening to The Classic Tales Podcast Season One the most enjoyable? BJ Harrison is one of my favorite narrators. I admire his mission to bring the Classics to all ages. There are some I've never taken the time for and others that I listen to over & over. Would you consider the audio edition of The Classic Tales Podcast Season One to be better than the print version? Good, well-written and well-read but I don't appreciate horror. There was so much of it that I quit listening. I listen for pleasure and relaxation. Most of these were horror stories. I enjoy classic short stories and have several audiobook collections of them. Some of the older ones suffer from poor production quality. Some of the older and newer ones suffer from poor quality narration. Often the selections are higly redundant from one collection to the next. This audiobook, however, is one of my very favorites. The production quality is superb. The narrator is consistently imaginative and compelling. And, along with some of the standbys found in similar collections, this includes some inspired alternatives. "The Classic Tales Podcast" is thoroughly enjoyable and entertaining, and I recommend it to anyone who enjoys listening to classic literature. What would have made The Classic Tales Podcast Season One better? What was most disappointing about Various’s story? Would you be willing to try another one of B. J. Harrison’s performances?